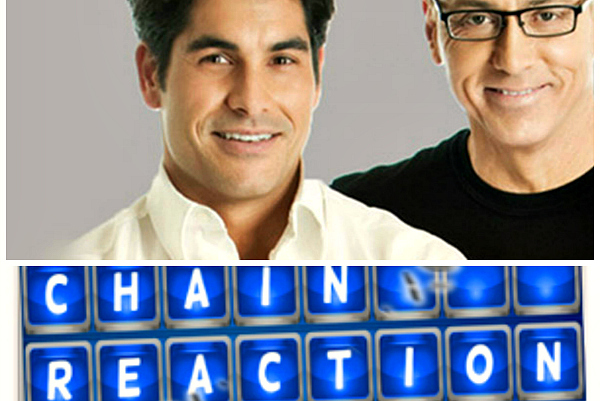 Hollywood Junket recently was on the set of newly re-envisioned GSN game show “Chain Reaction”. The show is hosted by popular radio personality, Mike Catherwood (a.k.a “Psycho Mike”), who co-hosted “Loveline” with Dr. Drew. Mike entered the stage and began the television show with a quick example of a chain. The audience chuckled and the game started. He introduced two teams, each consisting of two different players. On this particular day, it was “fit versus flabby.” One team was two fit brothers who had a strong resemblance to Tyler Posey, from MTV’s Teen Wolf , and the other team was two friends, one was an Uber driver, and the other was a stand-up comedian who frequently went on tour. Pictured: Game board from an earlier Chain Reaction version. The game began with two different words placed onto a board, one is at the top, and one is at the bottom. There are five different words that need to be filled in between those initial words to complete the chain. The first round of the game has the contestants complete two chains. The first chain each correct word answered correctly is worth $100, and for the second chain, each correct one answered is worth $200. The most entertaining part about watching the show is watching people get stumped over incredibly easy words. It is also funny to see them guess words that clearly do not make any sense in that chain. The second round consists of the teams attempting to complete another chain, and by the third round, contestants must start betting some of their money. They are allowed to bet $100-$500 over guess in an attempt to increase the amount of money they have. At the end of this round, the losing team says goodbye and the winning team moves on to the final round. The final round is very difficult because they must complete the chain in 45 seconds. If they manage to pull this off, they earn an additional $5,000! Mike Catherwood is an excellent host. He is witty, always on point, and the perfect dash of snarky. He works well with contestants and brings out the best in them. In this episode, he had the fit brothers flex their biceps to show the audience members who’s are bigger. He also asked the “flabby” contestants if they were ever fit. What could have sounded mean turned out to be a light hearted, humorous question. 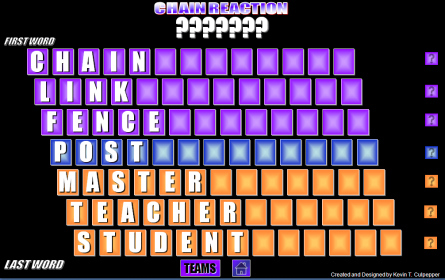 “Chain Reaction” is the perfect game show for college-aged students because some of the chains are quite crude, and Catherwood’s humor works remarkably well for this demographic. Check this show out when it make its come back later this year with 40 new episodes! The game show last aired in 2007.